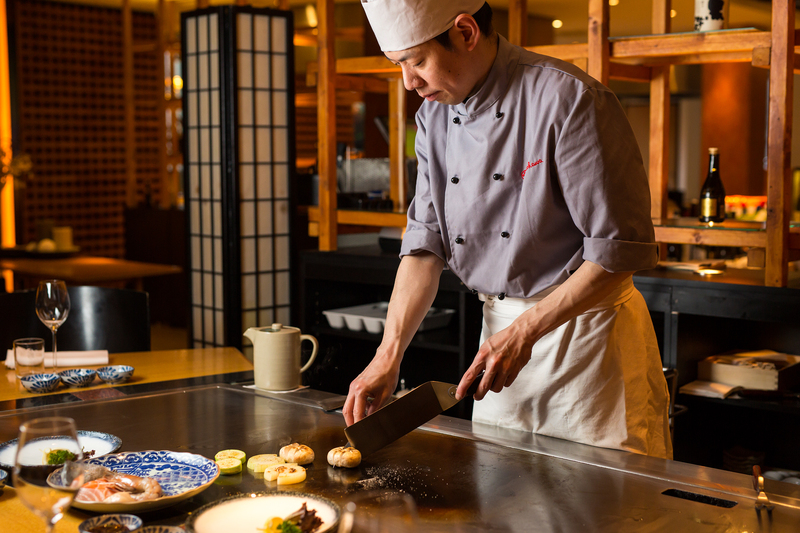 For over 25 years we cultivate an authentic Japanese dining experience known as teppanyaki. With the use of the carefully selected ingredients, our chefs open up the world of a Japanese cooking ritual. Teppanyaki (‘teppan’ – iron plate, ‘yaki’ – grilled) concept stands on three main pillars: exceptionally fresh ingredients, proper equipment and the chef mastery. Teppanyaki focuses on pure wholesome ingredients complimented by light seasoning. The quality of components – meat, fish and vegetables – needs to meet the highest standards. To make sure that the dish is soft inside and crispy outside, the table is heated up to 250-300. A teppanyaki technique becomes an art in hands of the chef. An outstanding choreography of cutting, turning and flambe ingredients happen right in front of you, ending in a graceful set of elements ready to be tasted. Our Modern Japanese Cuisine is a delightful exemplification of elevating the sense of authentic Japanese cuisine to the new levels. Being faithful to our heritage we use new cooking techniques to create unique sensual experiences. Our rejuvenated vision of the Japanese tradition will help you discover your favourite flavours once again. 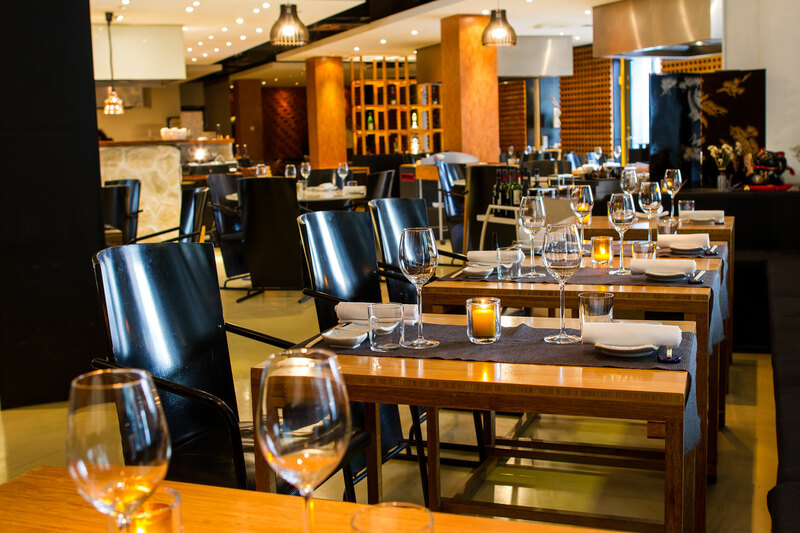 Our contemporary kitchen concentrates on seasonal ingredients and strictly selected products. The dishes which bring what the best in Japanese culture and redesigned to reveal a new essence and satisfy even the most demanding tastes. Embracing pure natural ingredients by using the innovative cooking techniques we help you to intensify your culinary experience. At the teppanyaki table, you are right in the middle of the process watching the food being prepared and instantly served to your plate. Our teppanyaki tables are perfectly suited for 9 persons, that means it’s a great choice for business meetings and family celebrations. Would you like to enjoy teppanyaki in 2 persons? Not a problem at all – you will be seated with other guests and you will have an amazing opportunity to meet new people and extend your social network! At this section, you can fully enjoy privacy during a meeting in a very intimate atmosphere. It’s also a perfect spot to share your time with friends and family. Our “Kyou Taku” concept, which literally translates to “together around the table” reflects a truly Asian approach to dining. Eating together means much more than only food and shows the love and respect to people with who we share our time. According to the concept, we put all the dishes in the middle so you could easily experience it with all your companions. The art of sushi and sashimi is what motivates us to strive every day on our path to mastery. Sushi with its pureness inspires absolute perfection. It’s why the honour of cutting sashimi and making sushi only belongs to the most experienced chefs! Seasonal products are crucial for bringing the best of sushi. Strictly selected ingredients transformed with a patience and precision into the small exemplifications of beauty and perfection. We are focused on embracing the feel of authentic traditional Japanese experience adding a slight modern twist to increase the level of excitement even more. Enjoying the evening at our sushi bar gives a unique opportunity of witnessing the art of sushi arising in front of your eyes. 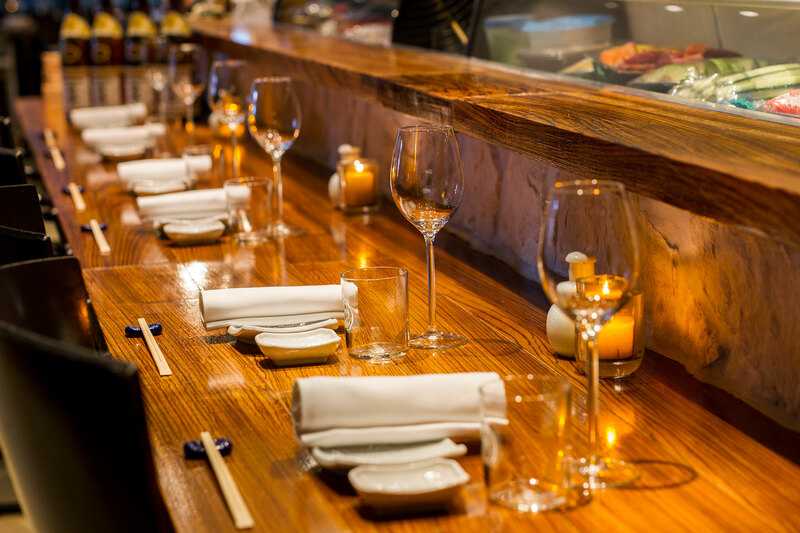 Our stylish wooden sushi bar provides a perfect spot to witness the outstanding process of creation. An authentic experience recommended to everyone interested in Japanese tradition.